It’s like we’re living in a never-ending April Fool’s day. Full of crappy jokes. Well past April Fool’s Day, the Liberal government of Justin Trudeau and his minister of environmental propaganda**, Catherine McKenna, has given a $12 MILLION Government of Canada check to a huge, very profitable company, for basically doing their business like most every other business does or tries to do. That’s your cash at work, to help somebody else get (even) richer than you. Oh thank you Loblaw. Smooch. Loblaw is one of Canada’s biggest companies — it’s a multi-billion-dollar company, and it’s owned by the Weston family, one of the richest families in all the land. Any land on Earth. You, personally, probably aren’t as rich as their dog walkers. Did you get a check from the government to buy a new fridge? Not likely. In fact quite the opposite. But the $12 MILLION of YOUR money was for LOBLAW’S new fridges. And you wonder why Canadians and Americans are bitter about the economic divide between rich and poor. And why they vote for people like Donald Trump who call out the likes of Catherine McKenna and Justin Trudeau and other elitists and, well, insert your own scary word here. Are they merely nincompoops? No we’re past that. They’re’ much worse than benign nincompoops. ** For more on why I call her the propaganda minister, just read McKenna’s Twitter feed. It’s absolutely awful. It’s actually a little scary. Or it’s funny. I’m not sure which. This feed is literally straight out of George Orwell’s 1984. She literally, not figuratively, mimics Orwell’s Ministry of Truth (Newspeak: Minitrue) — the ministry of propaganda. It’s really quite remarkable. Look at her feed yourself and you tell me it’s not something directly taken from Orwell’s Ministry of Truth. It’s chock full of overt political propaganda and nothing but ideological, political propaganda, reinforced over and over. Many times per day or even per hour. This is not some sort of helpful or typical government of Canada information service that is being provided by a benevolent government ministry, full of great info and moderation and balanced information designed to assist all of Canada. This is pure straight-up political propaganda delivered in a methodical, awful way. The only saving grace is that we’re not forced to read it, 1984-style. Although I wouldn’t put it past them. 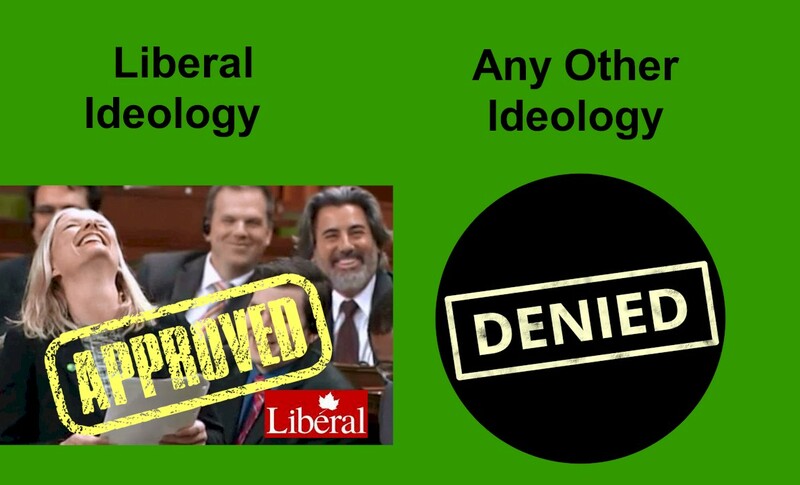 It’s an official Liberal (and Liberal only) government propaganda machine — there’s no other way to describe that mess. They think if their ideology is repeated over and over enough times, people will start to believe it. Alas they’re sometimes right, as those of us who read 1984 remember in that fictional account of socialist, dictatorial future horror (McKenna, it was supposed to be a warning!). They’re political propagandists, nefariously using Twitter like some kind of a 1984-style left-wing dictatorial government mind control and ideology campaign machine. They’re not the noble “champions of all Canadians” they so seem to think they are and want you to believe they are. Nearly every tweet is either the repeated propaganda, or bitter (but also repeated) hit jobs on Ontario’s Doug Ford government’s supposed lack of “climate action,” or that of the federal Conservatives (who are literally portrayed as immoral and downright evil); or hits on anybody else who doesn’t agree with them — Canadians all. You’re either with them, or you’re evil and immoral monsters — deniers — and you want to kill all the babies and end the world. Luckily, to those of us who possess a modicum of intelligence, McKenna doesn’t come off as even remotely credible, simply because she does repeat the same thing, the same ideology, over and over like a lunatic. She comes off as an unhinged, over-the-top, obsessed climate extremist, who has really gone off the rails and needs a rest. The whole bunch need a rest. Taxpayers do too. We’d be at least $12 MILLION richer today if not for them.